The Algarve in Portugal is a beautiful area on the south coast of Portugal. It is well-known for its beautiful nature, its wonderful sandy beaches, its championship golf courses and luxury resorts like Vale do Lobo and Quinta do Lago. In these luxury resorts Residence Royale selected a large number of luxury villas, all with private pool. 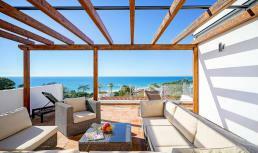 We also found luxury villa rentals in Vilamoura and Carvoeiro, close to golf course and beach. Enjoy a perfect sun or golf holiday in one of Residence Royales luxury holiday villas.